Remember the 2013 Auburn-Georgia game? It was so loud poor Angela—ANGELA!—couldn’t even hear Nana shoutin’ to her from just down the hall when she got home. The temporary deafness wasn’t just result of naturally-occurring third down thunder, or the collective whoooooosh of everyone being caught up to the 7th heaven there at the end. 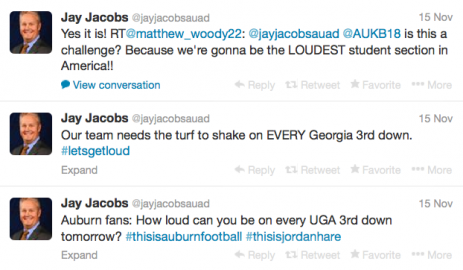 No, there was an edict—a tweetdict—from the Athletic Department, from Jay Jacobs himself, urging the performance of a lifetime, with Auburn fans starring as the Israelites, and featuring Aaron Murray’s skull as the walls of Jericho. Fifty years ago that would have been absolutely unheard of, so to speak. In a recent letter from the Commissioner of the Southeastern Conference to the sports editors of campus newspapers and SEC area daily newspapers, a new rule concerning excessive noise has been explained. Noise, particularly noise created in an unsportsmanlike gesture, is a serious problem today at many intercollegiate football games, the letter said. The Southeastern Conference is approaching the problem via a method unanimously approved by the head football coaches and athletic directors. 1. When the offensive quarterback feels the noise prevents reception of his signals by his teammates, he will hold his position at center and look toward the referee. If the referee agrees, he stops the clock. 2. The referee then approaches the defensive captain and instructs him to request quiet, which he does by moving toward the noise area and raising both arms. If necessary the offensive captain will make the same request on the opposite side of the field. 3. Captains return to positions and referee gives “ready” signal. If the offensive quarterback still feels that the noise interferes with his signals he again holds his position and looks toward the referee. If the referee agrees, he again stops the clock and steps off a five-yard penalty against the proper team. 4. This procedure with the five-yard penalty is repeated until the noise is at a normal level, as decided by the referee. 5. Should the referee not agree with the quarterback when he makes an inquiring look, thus ruling the signals can be properly heard, the quarterback is required to put the ball in play within 25 seconds. 6. Should the quarterback move away from center without authority, that is, the referee’s whistle denoting agreement, the referee will ignore the action and still require that the ball be in place within 25 seconds. The penalty for failure to initiate a play on time is also five yards against the offensive team. I’ve always seen these fine print little lip service exhortations to keep it down and be polite in 1960s and 1970s gameday programs because, hey, you never know, you might make the ref mad or whatever and, hey, you never know, he might take it out on the team. A 1972 Auburn Football Illustrated asked fans to keep it down in order to keep the Tigers from being penalized for excessive crowd noise. But to see the breakdown of the rule—and that there even was an actual rule—is kind of wild. Was it ever enforced? Is it still technically on the books? If so, does it ever come up outside occasional Mississippi State road games (other than that time they fined us for letting Ozzy Osbourne heckle Florida a few seconds too long in ’06)? Today, it’s the hurry-up offense. In ’64, it’s like someone in the SEC was basically trying to kill the home field advantage. Auburn home games without Crazy Train third downs? Crazy. Related: Iron Bowl Earthquake? ‘Suspicious’ seismic activity registered Saturday as far away as Huntsville correlates to Auburn’s last second touchdown to beat Alabama.